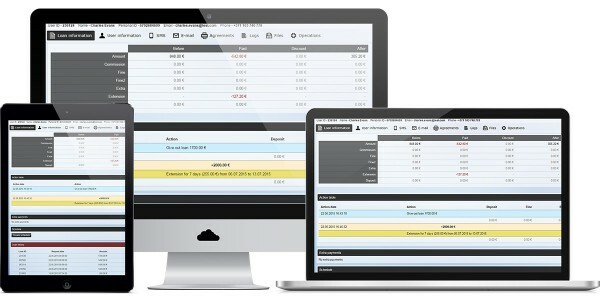 Detailed information about any of your clients can be displayed in a configurable view. Think of the client cards as a database of dossiers which can be appended with your own notes or dynamic data. The information regarding clients and loans is splitted in logical blocks of data. These blocks can be arranged and sorted depending on the status of the loan. The blocks are sorted by functionality and permissions which can be added or revoked by administrators. User data like name, personal ID or email can be edited from the client’s card in the administration panel. Option to filter users similar to surname, email and other criteria to detect potential fraud or analyse user family member total loan sum. Option to compare the incomning loan request with already gathered data. The system will score the probability of loan return based on age, loan amount, days to return the loan etc. Option to put down notes for specific loans or clients. The notes can be written on any subject in plain text. View notes regarding a specific client. View notes regarding a specific loan. Option to create a reminder (for example, remind that the client promised to repay the loan in 5 days). Option to detect potential fraud by people using proxy servers to mask their identity. Option to determine an approximate location of the user by their IP address. Various 3rd party API’s for data exchange can be implemented. Documents and notifications sent to clients are being stored in an archive for every user. Emails sent to users are stored in an archive for later review. SMS messages sent to users are stored in an archive for later review. All the system generated agreements are being stored and can be accessed in users profile. Invoices that are generated and sent to users can be reviewed in users profile. Any files that are uploaded on the server by client or operator can be reviewed. Actions performed by users and administrators are being logged in a technical log (regarding processes taking place on the server), and action log (a more semantic approach – this log lists the actual actions of users and administrators, like approving a loan). Action logs contain information about the client and the loan. For example, this log would tell that a certain customer applied for a loan, and the loan was successfully issued. Technical logs contain information regarding the inner processes of the system – which parameters were changed. Every time a user authorizes, the IP address and time of login is logged. It’s possible to make a loan request form within the administration panel manually. Option to register incoming payments for a specific loan. It is also possible to filter types of loan extensions and other data regarding loans. Option to arrange priorities of the loan payments. Option to extend loan period. Option to decrease the amount of penalty payments with a discount. All the incoming and outgoing transactions can be reviewed with ease. Review a full history of all the loans issued or denied and the resulting actions for a specific user. Option to create a repayment schedule for a client which is then taken in account by the system. Option to simulate a login to the public sites clients profile, while keeping his credentials and passwords private.